Director Roland Emmerich is back with White House Down, his most entertaining piece of brainless summer fun since Independence Day. Make no mistake, the alien invasion depicted in that 1996 blockbuster is only slightly more preposterous than anything that occurs in White House Down. It’s nothing more than escapism and isn’t likely to stick with you much longer than it takes to exit the theater. But it’s also a fast-paced ride, with Emmerich and screenwriter James Vanderbilt (The Amazing Spider Man) winking at us the entire time. They know it’s all ridiculously improbable and the streak of humor with which they infuse the film makes that quite clear. Channing Tatum stars as John Cale, a US Capitol Police officer who wants to impress his daughter by joining the Secret Service. 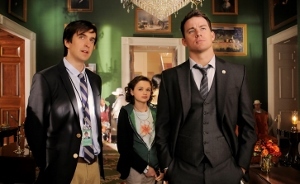 Preteen Emily (Joey King) has little respect for her dad but idolizes President James Sawyer (Jamie Foxx). If he can’t be his daughter’s hero, he reasons, maybe he’ll score some points by protecting the man she so admires. Unfortunately, former colleague Carol Finnerty (Maggie Gyllenhaal), a high ranking Secret Service agent, doesn’t think he has the follow-through and passes on John after a quick interview. Emmerich knows better than to prolong the setup. While John and Emily are touring the White House, a group of terrorists disguised as janitors blow up the Capitol building and simultaneously seize control of the White House, including President Sawyer. Emily was in the bathroom at the time, giving John the double opportunity to rescue his daughter while making up for the bad job interview by guarding the President. 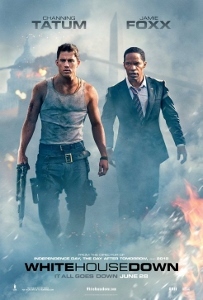 The first half of White House Down is excitingly taut, but as it drifts towards near action-comedy territory, I wouldn’t blame anyone for growing a bit weary. The saving grace is that no one seems to be taking the entire affair all that seriously. Breakout Kings’ scene-stealer Jimmi Simpson enters as a super computer hacker, one of the hired guns behind what turns out to be a far-reaching domestic terrorism plot. Unfortunately, his primary character trait is that he likes lollipops (Simpson deserved more). Emil (Jason Clarke) and Killick (Kevin Rankin, strongly evoking Robert Patrick) are the top-dog mercenaries leading the White House occupation. Richard Jenkins is on hand as Speaker of the House and James Woods is a top presidential aide; both rely on their well-established screen presences, but neither seems especially committed. The film’s secret weapon turns out to be Joey King (China Girl in Oz the Great and Powerful) who makes Emily’s actions believable (no matter how much our rational thought process wants to resist), taking “girl power” to a whole new level. Remember that fifth Die Hard movie that dropped early in 2013? Yeah, I’m trying to forget that one too. 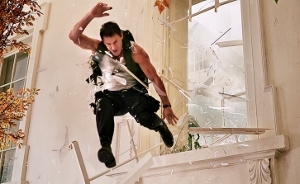 White House Down is everything we want from a Die Hard movie that we simply didn’t get that last time from Bruce Willis and company. 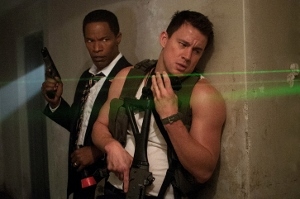 Channing Tatum continues to emerge as a versatile, likeable star and Jamie Foxx gives as an action hero president to really root for. No matter how many times I rolled my eyes, I was immediately reminded that the filmmakers were rolling theirs too. Get out of the sun and go with the ride for a couple hours and White House Down should satisfy your blow-‘em-up, shoot-‘em-up action sweet tooth.